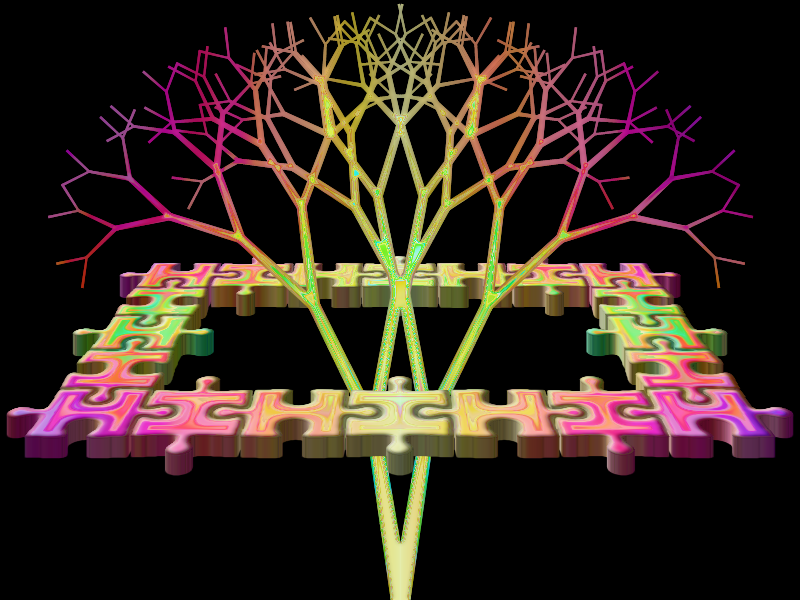 By Red ochre, October 13, 2015 in Plugins - Publishing ONLY! 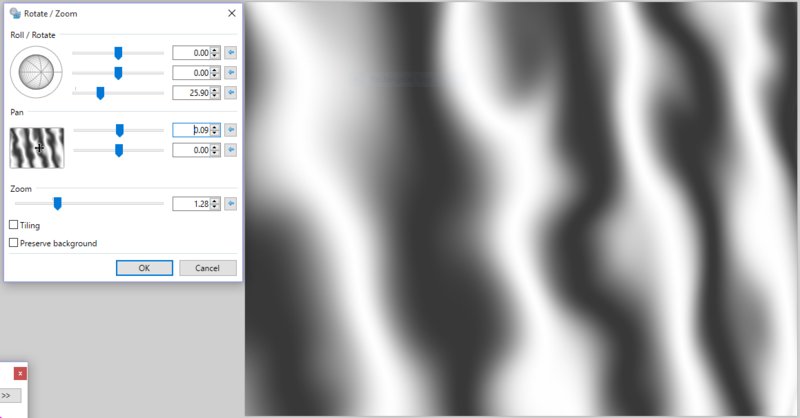 Description: Uses the clipboard image tone to distort the current layer. 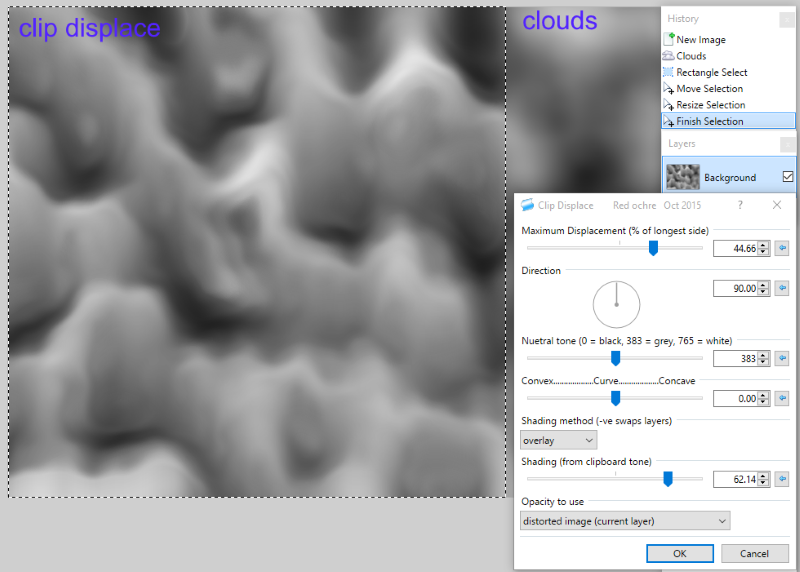 .dll names: ClipDisplaceAA (This version only works on Pdn4.0.8+)- previously called just "ClipDisplace"
ClipDisplaceAA.zip Updated version with smoothing thanks to "MJW"
This is not a new idea, it has similarities to the "Displacement and Alpha mask" http://forums.getpaint.net/index.php?showtopic=9869and others. It relies on the codelab code for reading the clipboard (Thanks BoltBait!) 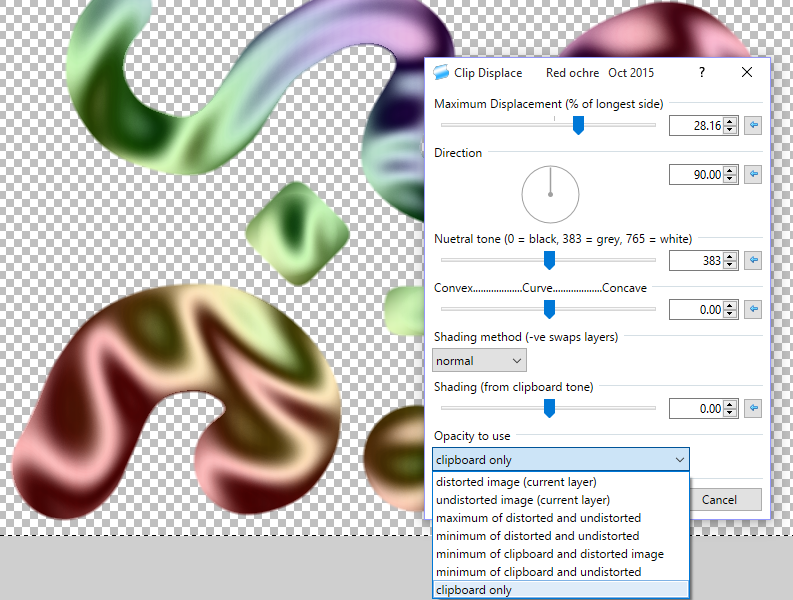 and in the Pdn4+ version there are options to use the clipboard opacity for masking purposes. 1. Select and Copy something (this places that image on the 'clipboard'). If nothing useable is on the clipboard it will use the current selected layer. 2. 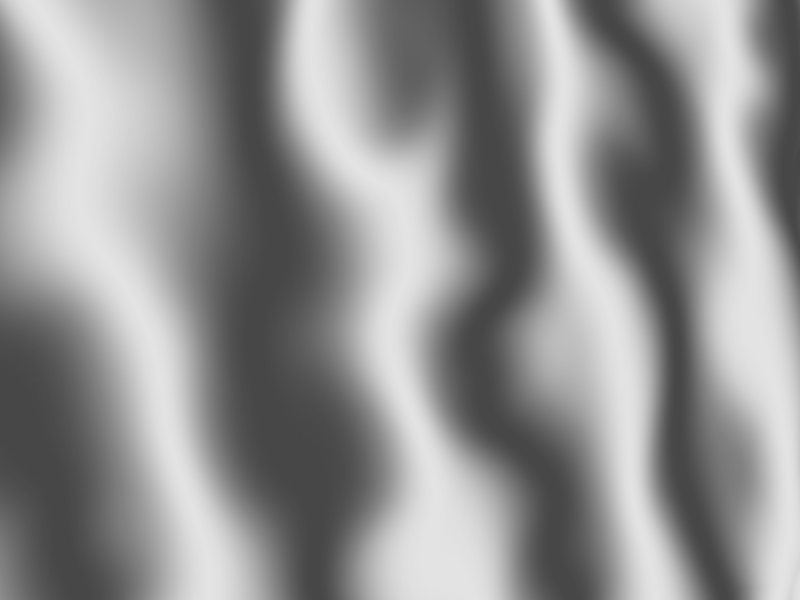 Move to the layer with the thing you want to distort eg. 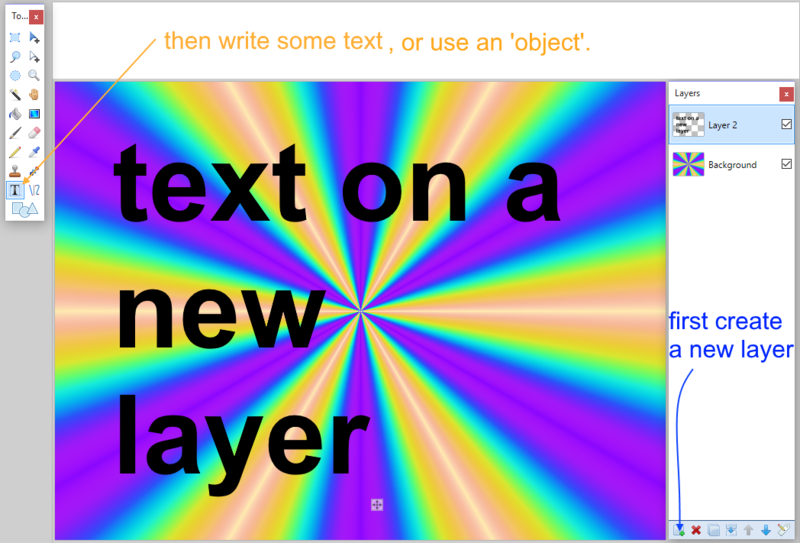 text or an object (flag in this case) and play with the controls. 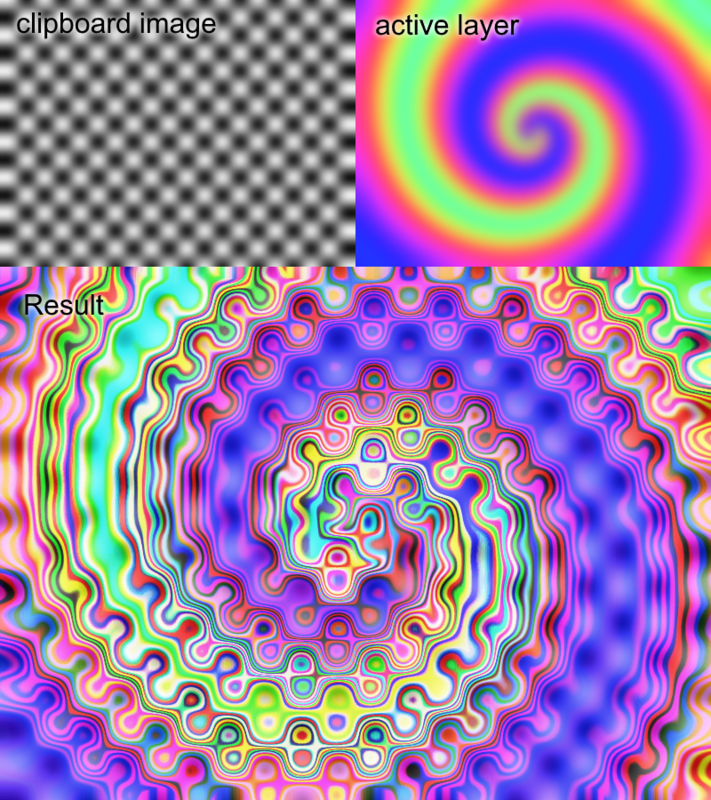 Here is a very brief tutorial showing how I made the clipboard distortion-map image. Please do experiment and post images in this thread! Here are some things made using it. Here are some more instructions on how I got the text mask image... hope it helps. 2. Create a new layer and write some text or use an object or shape. ... or use TR's Contour Filler. 4.Now Copy the whole text layer. 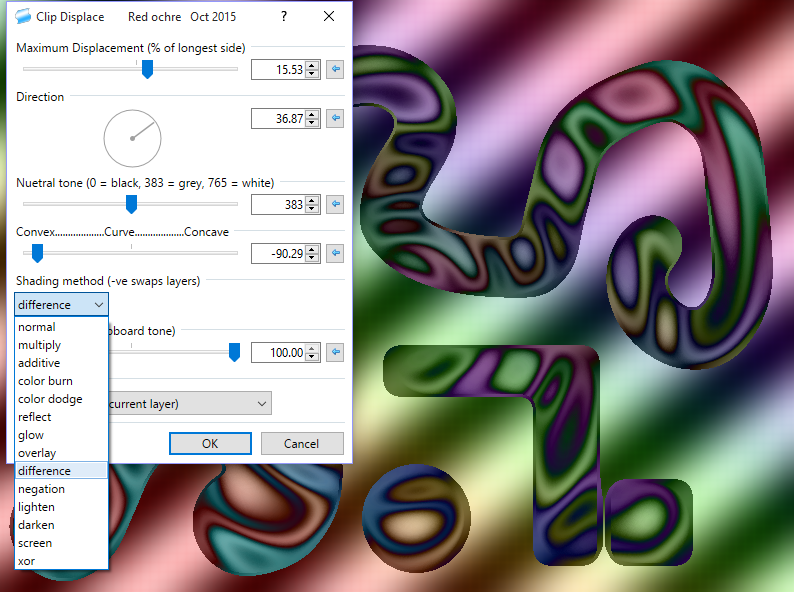 Turn off the text layer's visibility and make sure you are on the bottom (coloured) layer. 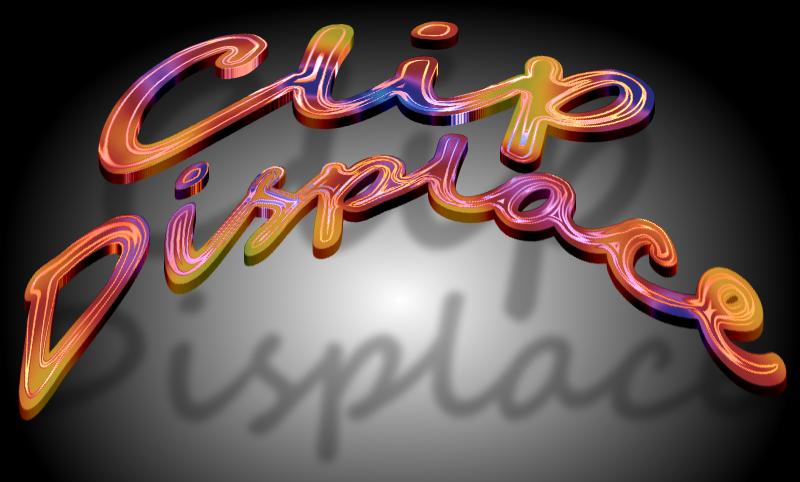 Run the Clip Displace plugin. But the new realization. Very interestingly and fascinatingly! Oh, a new toy to play with whenever I feel like procrastinating on other matters! I will it try it out later this week but in the meantime many thanks for the 3.5.11 version, Red! Thanks Red, this is hot. I smudged the letters a little bit. Cool (and hot) Image Eli! - many thanks for posting it. Perfect!!! Almost no tweaking what so ever. Great job Red! 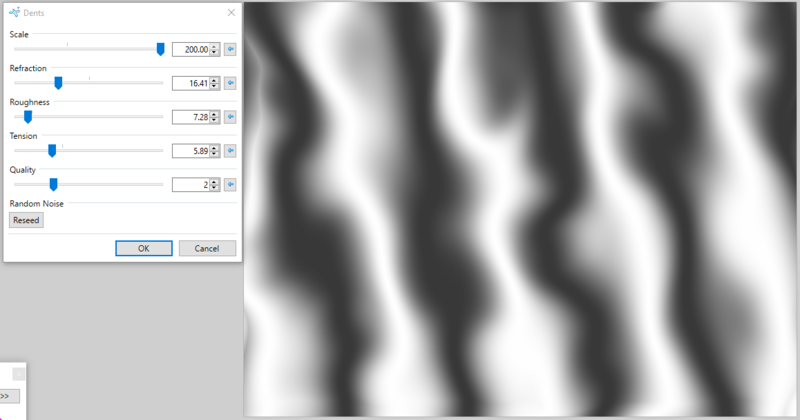 And i deleted the white around the couch and increased the contrast before copying to clipboard. Good work on the chair TR! (thanks for posting the image and the settings). Your rotate/zoom method for the chair is more technically accurate but that image should give the user a good idea of what the recovered chair would look like. Thanks a lot @Red ...... very clever indeed . 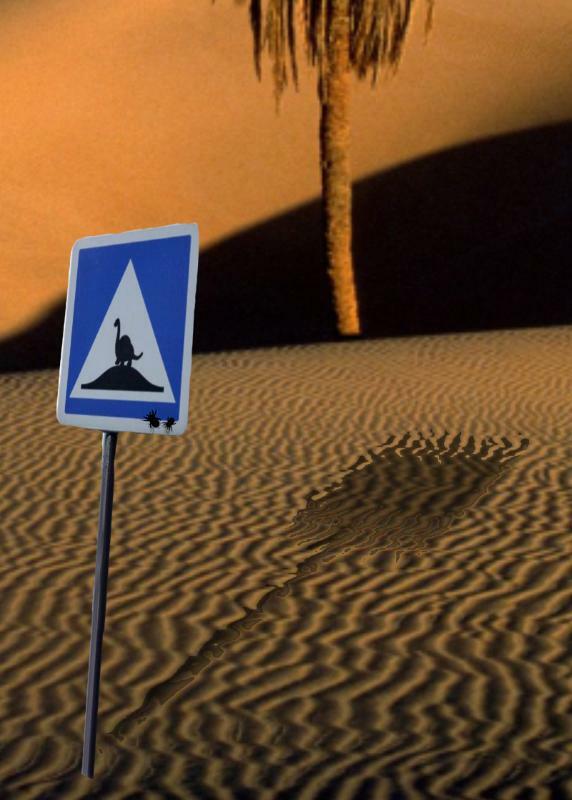 Clever shadows Pixey - thanks for posting the image! Red ochre! I Tried, but didn't get out. 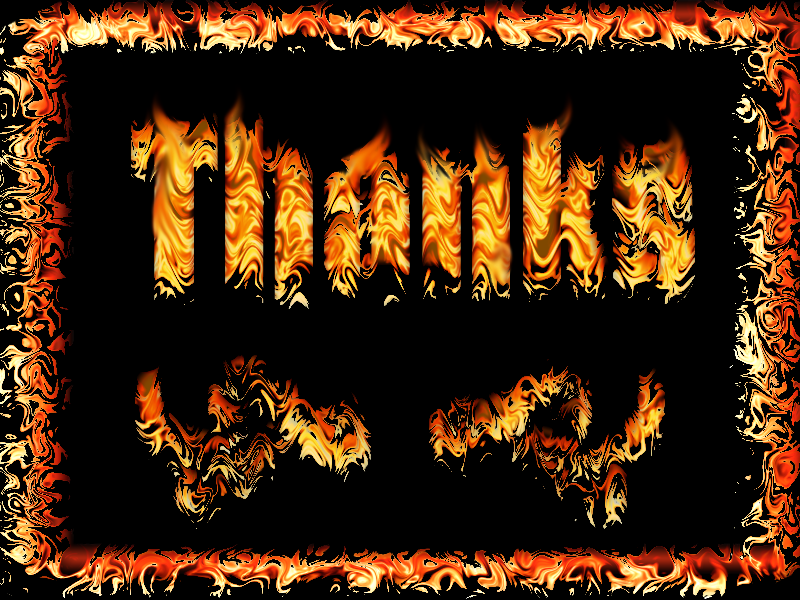 Thank you so much for the plugin and your effort. Just tried to follow the screenshot (taxt mask) Can you explain how you made the text coloured ? 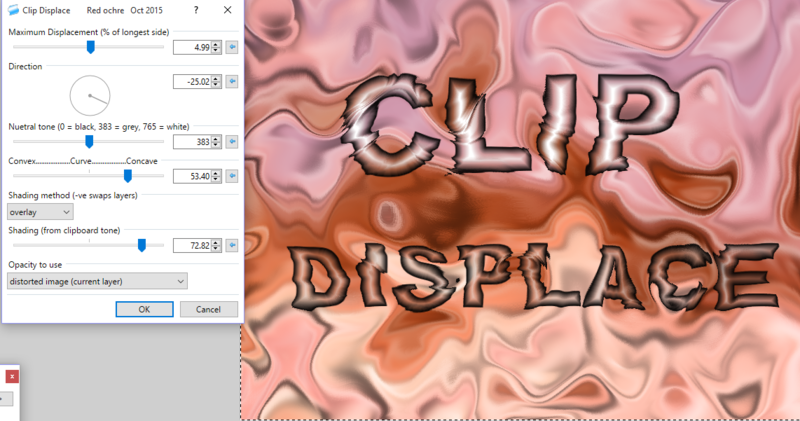 I coppied the text layer (lower layer) to the clipboard (as shown) unticked the middle layer (the colour) and then ran clip displace on the upper text layer and got nothing. 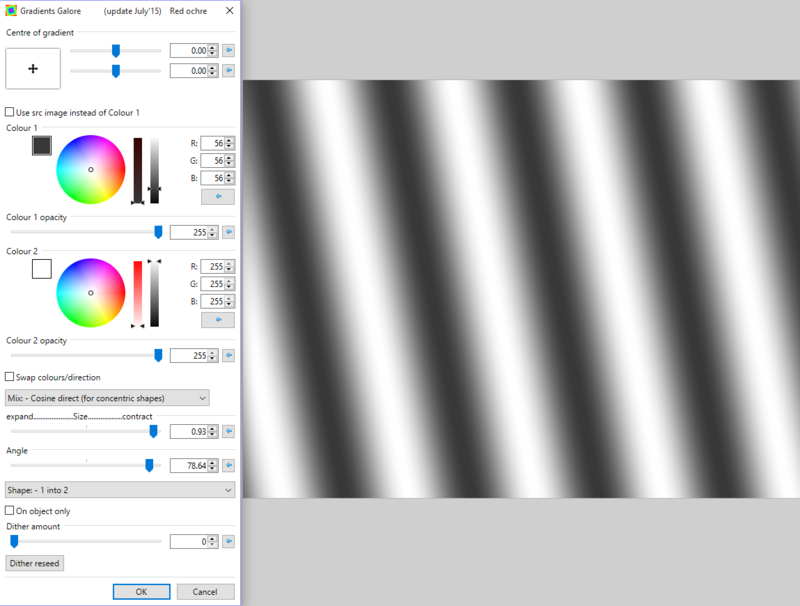 Also if trying to distort an image with something on the clipboard, the shading method slider has no effect, neither does the Opacity to use slider. I'm pretty sure I am getting more stupid as I get older, but, this plugin has me lost completely. Hello nitenurse79, I also followed the steps and the settings and all I got was black text. I think REd meant to show that the ticked "Current layer" was the same as the unticked layer "Currrent layer" before the effect was applied. Also if you run TR's Contour Filler on the text before copying it to the clipboard you get a pretty good color effect. Hi Eli - I have tried that, but the lower layer is the one coppied to the clipboard, not the middle one, I will have to try again another time, thanks all the same. Don't be too hard on yourself, I can't get it to play either, no matter what slider I move, I get nothing apart from warped black text. 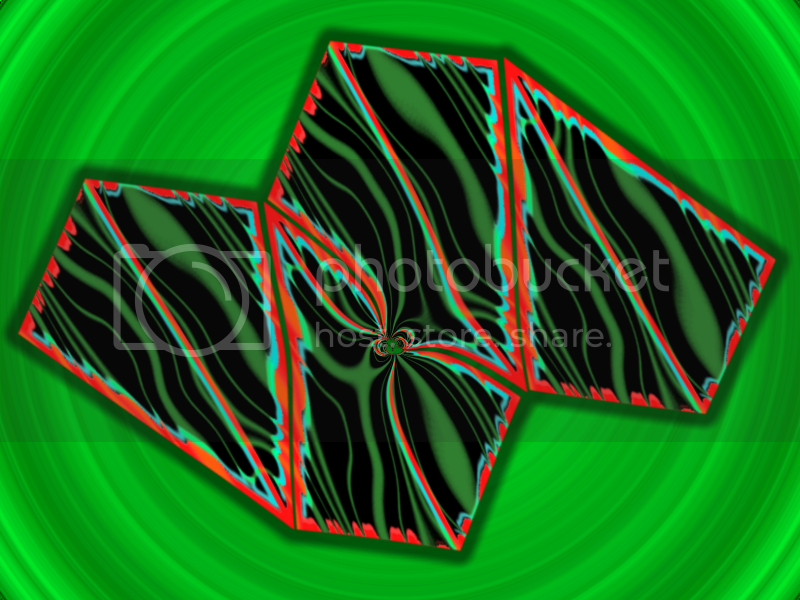 My fault nitenurse - I should have used 2 screenshots - will try to recreate and post more screenshots. Eli got what I was trying to show. Sorry Sasha and Seerose. 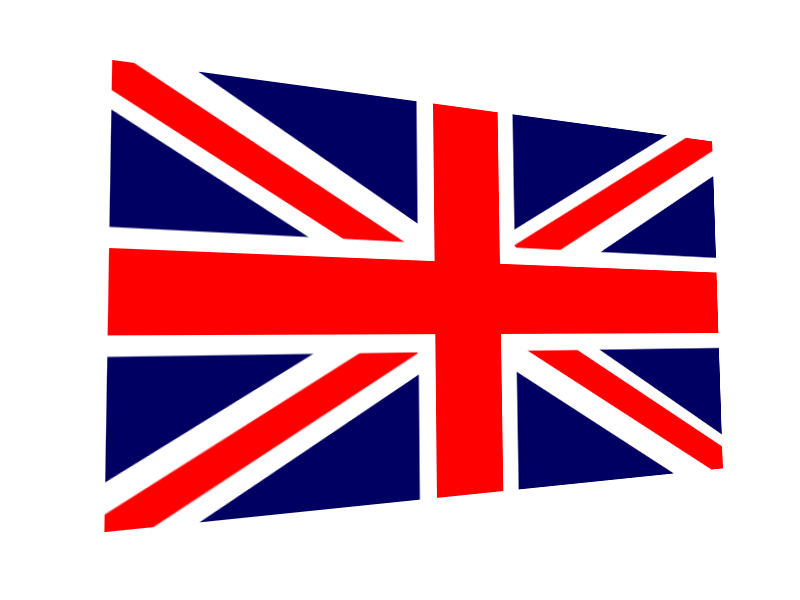 Try the flag example. 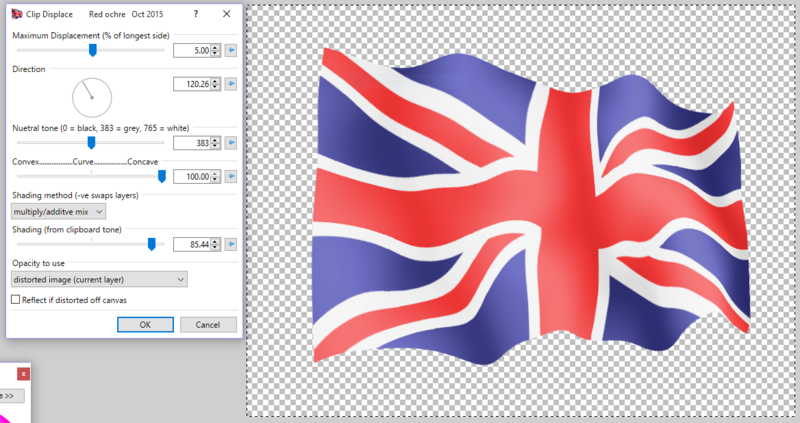 Download the flag and the grey texture and have them as two layers in Paint.net. 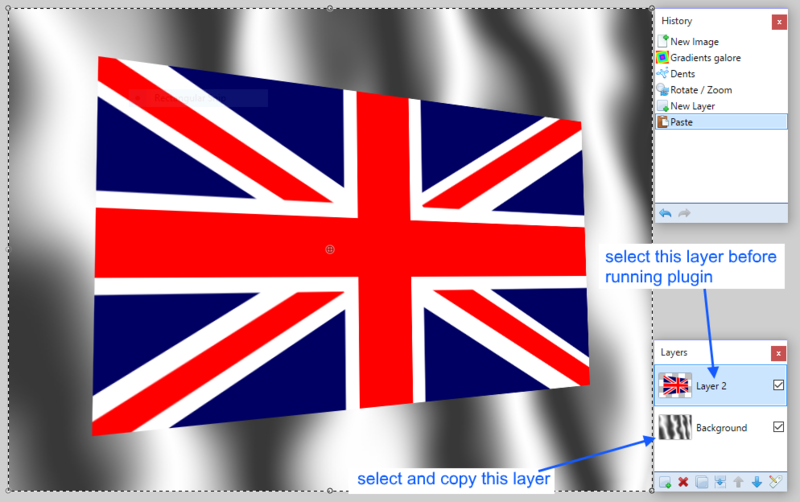 Copy the grey layer then move to the flag layer and run the effect. I'm not very good at tutorials I'm afraid. Thanks for posting the image Oceana. (+1 'in the post'). 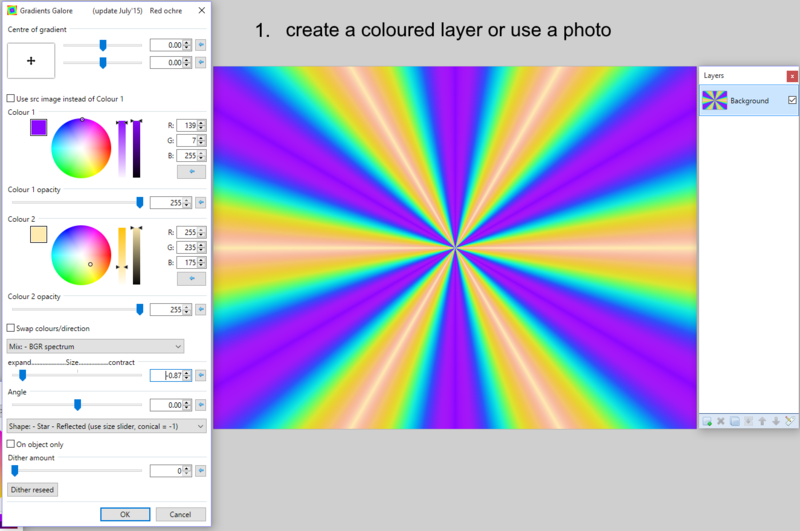 I've added more instructions on how to use as a mask at the top but will put them here too. Glad you're finding it useful Racerx - thanks for posting the image! 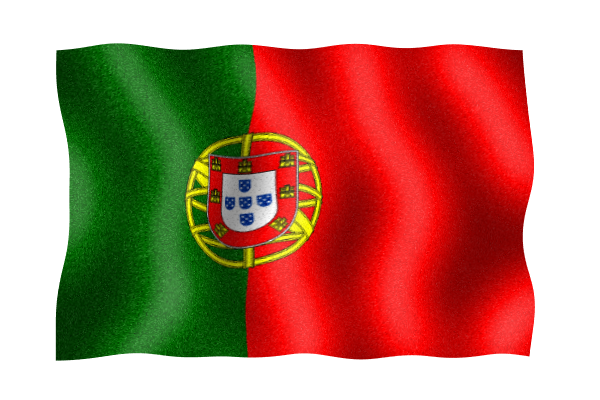 Yes, Portugal. I was born there and we moved to the USA when I was 5 years old. Surreal image Eli... I like it! Sorry for the confusion. Will try to update my pack when I get time. A very interesting plugin, but I think it would be even better if it had a supersampling antialias option. Nitenurse's example would look ever so much better, I think.